It is literally impossible to remain in perfect health 100% of the time. There is a plethora of reasons for this, ranging from exposure to viruses, bacteria and microbes, use of medications, varying degrees of stress, varying degrees of sleep deprivation, different life stages (adolescence, pregnancy, breastfeeding, ageing etc) or health states (chronicity, progression etc). Because your body is in a state of almost constant fluidity so should your approach to your health. Why set a rigid plan of don’t, avoids and non-negotiables? Only a small fraction of people actually achieve their New Year’s resolutions, and I don’t think it’s because it’s too hard/impossible to change or that living a healthy life is unachievable. I think it’s because we make our goals unattainable by being too rigid with the what, when and how we are going to achieve these goals. We implement these punishment and reward systems to try and get us there (lose this much weight and you can eat this, buy yourself x item, get married, go on holiday), and if you are the parent (or spend enough time with children) you will know that these systems generally don’t get you the results you desire. Or maybe they do but the outcome is very short lived, like asking your children to behave and they can have ice cream and then watching said good behaviour deteriorate once that last lick has occurred (not that that has ever happened to me ;P). I see many clients who have goals of losing x amount of weight by x amount of time, or to completely quit sugar/cake/chocolate/coffee/cake and never touch it again, or to stick with that diet or protocol they were told they *must* do or they’ll never be healthy. Although I work with my clients closely to achieve some of these goals, I also work with them to be flexible and realistic in how they improve their health. My number one aim when you work with me is to come up with a plan that is practical, achievable and sustainable and completely specific to you. I am not suggesting that you can’t or shouldn’t want to lose weight, improve your diet or exercise more, I’m suggesting coming up with goals that allow the ebb and flow of life to occur, that fit in with your work/home/parenting/studying schedule and that allow you to veer off the ‘path’ and come back to it. This will enable you to have the most long-term results and leave you feel empowered and in control of your own health. Instead of focusing on weight loss in a specific period of time that can only be achieved by sticking to a strict and restrictive diet, why not focus on eating mindfully, eating what you enjoy and addressing other factors that may be affecting your weight such as stress, sleep or hormone health. Ditch the timeframe and accept that it takes time to implement and see changes. Or instead of focusing on weight loss to change your body shape or size or because someone told you you needed to lose weight, focus on self-compassion and love, eating well and moving your body because it makes you feel good. Or focus on feeling good and loving your body as is and not focusing on weight loss at all. Instead of going cold turkey and quitting sugar or processed foods, why not increase cooking and eating the healthy foods you love and enjoy. How about ensuring that you are nourishing and caring for your body instead of depriving yourself or keeping yourself hungry in situation when there are no alternative foods to eat? We have so many nourishing and delicious recipes here on the website. Instead of addressing your mental health by asking for help on online forums, signing up to free programs that will ‘cure’ you or force yourself to meditate when it never seems to work for you, how about spending less time online and more time outdoors? Or book that appointment with your doctor to ask for a mental health plan and lock in a session with your psychologist. Or see a naturopath (like me!) who will spend the time with you to come up with a plan to support and nourish your nervous system, working together with your GP and psychologist/therapist. Health is a fluid process, with which we need to be flexible and adaptive. Focus on health goals that easy and uncomplicated to implement and that have a positive effect on other aspects of your health. For example, you want to have more energy. Instead of signing yourself up for the latest multi-level marketing ‘transformation’ that promises more energy with a magic pill, ask yourself ‘am I really getting enough sleep’, ‘what is the quality of my sleep’, ‘how stressed am I’, ‘am I expecting too much from myself right now’, or ‘when was the last time I had a blood test?’. Perhaps set a goal of going to bed 20 minutes earlier each night and avoiding any screen time in the hour before bed or cut back on alcohol consumption in the evenings or your second coffee after lunch. Getting more sleep may flow onto better health choices the next day or hitting the gym, going for a walk or run before starting your day. These slight changes over time may mean that you shift a little weight that in turn makes you feel good and motivated to continue with these changes. Or maybe more sleep means less coffee throughout the day, reducing nutritional deficiencies and dehydration. Specific: choose a specific and well-defined goal. Ask yourself what do I want to achieve, how, when and why? Measurable: how will you measure the outcome and determine when you have achieved your goal? Define the physical manifestations of your goal. Achievable: is this something you can achieve? Realistic: set yourself up for success. Are your goals realistic in terms of your schedule, the time frame and other variables? Time bound: set yourself a deadline or even several deadlines but keep the timeline flexible and realistic allowing for things to come up or for that goal to be adapted as time goes on. And don’t forget, I am always here to assist you get your health goals on track in a way that is sustainable and achievable. Hello there! Thanks for welcoming us into your home! We are Westside Wellness - Melbourne's premier mobile naturopathy clinic. That means we come to you. We hold your natural healthcare appointments in the comfort of your own home. We thought you might want to understand why we do this and what the benefits are to you as a client. Westside Wellness is run by two registered naturopaths, Renee Irvine & Lucy McTiernan. We joined forces in 2017 because we both have a passion for supporting clients to make realistic and gradual changes to their diet and lifestyle, while using natural medicines to assist their body to restore homeostasis. We both live in Melbourne's inner west and love all that the west has to offer with its great food, supportive community and burgeoning trend towards healthy living. What Part of Melbourne Does Westside Wellness Service? We do offer services outside of this area but please note that travel costs may apply depending on the distance travelled. We also offer Skype appointments if you are located outside of Melbourne. We love home visits because they are the best way to get to know you. All the information we need about your health is at our fingertips. We can review previous blood test results, your supply of supplements or medications, open up your pantry doors and fridge to get a feel for your diet, and observe any home environment factors that might be contributing to your health condition. Comfort: you don't need too drive or travel to a designated clinic space. You can relax at your kitchen table or on your couch in your trackies. Timely: we offer home appointment outside of usual business hours as we understand you are busy with work/life demands. Targeted: because you can quickly show us which foods you are cooking with or what supplements you are taking there's less guessing involved for us. This means we get a better picture of who you are and how we can improve your health. Compliance: we have less appointment cancellations with home visits, meaning that you are more likely to see progress with your treatment plan as you can track your improvements from the comfort of your own home. Occasionally we hear from new clients that, for whatever reason, they don't want to invite us into their home. We understand that mobile naturopathy appointments are not for everyone and that is why we have partnered with Growing Bones in Yarraville village to offer in-clinic appointments on Tuesdays and Saturdays for those of you who would prefer to see us in a clinic space. We are two naturopaths but first and foremost we are parents and we understand that no-one lives in a picture-perfect lifestyle magazine shoot. Our homes are filled with mess and chaos and we expect to see the same at your house. Please do not feel any pressure to clean your home prior to your appointment. We are literally days away from Christmas, and for most of us this means good times, lots of yummy food and a drink or two. And while there is absolutely nothing wrong with that, many of us end up feeling bogged down, digestive symptoms flare up and we end up wishing we could have had a little more self control. Whilst we definitely don't want you to sweat the small stuff and feel anxious about a meal or two that might not be so healthy, we thought we'd share some of our tips for improving digestion so you can have you cake and eat it too. And the best thing about these tips? They can be used pretty much every day for helping to improve digestion. Add the juice of half a lemon to a glass of warm water (I do half boiling/half cold) and drink upon rising, or 15-20 minutes before breakfast (it’s also helpful before other meals too). This is like a healthy shot of coffee for your liver, without the caffeine comedown. It kick starts your liver for the day, increasing bile production which in turn improves your digestion. It’s particularly helpful after a night of booze and indulgent foods. This is a similar principle to the lemon juice, bitter foods help to stimulate liver function, but bitter foods also trigger the production of gastric acid. Sooooo if you’re eating a bit of a stodgy Christmas meal, a few bites of bitter greens first will get your stomach going to prepare for the rest. And it doesn’t have to be anything complicated, just chuck some fresh rocket (or a mix of bitter greens) in a bowl with cracked pepper and salt, lemon juice and drizzled olive oil and mix it all together. If you wanna get even fancier you could sprinkle a handful of roasted pine nuts on top. Gah, it is just too easy to become dehydrated over the festive season with all the booze, coffee/tea and just general lack of water consumption. Other than ensuring that you drink water regularly throughout the day (I always have my drink bottle with me as a reminder), perhaps serve your guests sparkling mineral water with meals, or herbal tea after meals. A simple and refreshing way to jazz up water for your guests is to add things like citrus slices to big jugs of water, loaded with ice; or a handful of berries and citrus slices, fresh mint and cucumber, or my favourite, a few handfuls of lemon verbena (we have tons growing in our yard). There are so many possibilities to make your water look pretty and taste fancy, and keep everyone hydrated. This is a big one; slow down, chew your food and digest properly. It’s so easy to get caught up in the excitement of the day, or the delicious smells of the food, and just scoff everything down with very minimal chewing. And what’s going to happen? All that food is going to hit your stomach like a ton of bricks and take ages to digest, potentially leaving you feeling all bloated and sluggish. Then before your stomach has had a break, you’re scoffing dessert down, and maybe a wine or two. So savour your food, enjoy the company, and chew your food thoroughly, your stomach will thank you for it. For those of you, who are real speed eaters, you might even find it handy to set yourself an amount of time to finish your meal. These days when I sit down to eat, I look at the clock and give myself a minimum of 10 minutes to finish my meal. Not only do I feel better for it, I appreciate the food so much more, and because I’ve chewed thoroughly and given my stomach time to start digesting, I actually notice when I’m feeling full and overeat less! Fruits like kiwi, papaya and pineapple contain enzymes that aid digestion.So how bout serving up a tropical fruit salad containing pineapple, papaya and kiwi fruit with lime slices as an appetiser for your guests? Not only will it be a refreshing way to start a meal, but it will also help to prep your guts for digestion! Sounds difficult yeah? Trust me, these are definitely not, and you’ll have them over and done with in less than 30 seconds. Before you sit down to eat, take 5 deep breaths; breathe in for a count of 5, hold for 2, then breathe out for 5. These exercise work by triggering the parasympathetic nervous system (also known as 'rest and digest') that helps to calm you, and is also responsible for triggering digestion. I’m sure most of us have experienced that tightness in our stomach from tension or excitement where you try and eat and the food just sits there leaving you with indigestion and bloating. So help cut down the bloat, take a deep breath or two and enjoy your meal. Alright this is one that I am definitely guilty of during the festive season. In case you can’t tell, I love food! And at this time of the year, I let myself be a little more indulgent than usual. But I always end up feeling so sluggish and bloated afterwards and it makes me question whether or not it’s actually worth it. So if this is you, perhaps taking a moment to think about whether or not you’ve really got room for that 2nd helping right now. Give yourself 10-20 minutes to digest and ‘make room’ for more food, you might go back for more or just realised that you’re perfectly sated and don’t need more food. In the past, I used to think about Christmas dinner as a time to eat all the roasted/baked things that I love: roast veggies, roast chicken or ham and in more recent years, a baked nut loaf. As time has gone on, and my tastes have changed, I think more and more about the salads and green things I’d like to eat with my roast dinner. And when I do eat a more balanced meal like this, I feel much lighter afterwards and definitely no food ‘babies’ the next day. And there you have it, some simple yet effective tips that will have you digesting better and able to enjoy the festive season without having to stress so much about what you're eating! If you're looking for some healthier recipes for Christmas, do check out our roasted turmeric chicken, sweet garlicky asparagus and others in the recipes section. We know it’s pretty on trend to talk about activating nuts, grains and legumes, and it’s fairly easy these days to find pre-packaged (and expensive) activated nuts and grains (haven’t seen legumes yet). We've read a few articles talking about why activating isn’t necessary, and many articles talking about why it is, so we thought we'd share our take on activating and why we do it. Plant based sources of protein such as legumes, grains, nuts and seeds are super good for you, not only do they contain protein, but they also generally contain complex carbohydrates, vitamins, minerals, and essential fatty acids. They are seriously awesome in our books. They also contain antioxidants called phytates (phytic acid) and polyphenols, which in some ways are good but in a lot of ways act as anti-nutrients when these foods are ingested. Both phytates and polyphenols exist in plant foods to protect them from being eaten and becoming rancid when they are growing. However, humans lack the enzymes required to break them down and this is when we encounter potential problems with digestion and nutrient deficiencies. Phytates and polyphenols have the unique ability to chelate (bind) to minerals such as zinc, iron, calcium, magnesium and potassium causing insoluble (undigestible) salts. This prevents us from obtaining the nutrients from the food we eat, and if you eat a lot of plant based foods, you could end up with some nutritional deficiencies and digestive problems. Traditional methods of preparing and cooking with legumes, grains and nuts help to break down these anti-nutrients, and these methods are becoming more widely implemented in modern day cooking. These methods include soaking, fermenting, germinating (sprouting) and cooking. We'll just be covering soaking (activating) for now, but will definitely touch on the other methods in future posts. Activating essentially involves soaking legumes, nuts, seeds and/or grains in water and adding an acidic or alkaline solution or salt to help break down phytates and polyphenols. Phytates are water soluble, so soaking in water alone has shown to be effective in breaking down these anti-nutrients but soaking AND the addition of ACV, bicarb or salt, helps to increase enzymes that break down phyates and polyphenols. Cooking, germinating or fermenting afterwards further increases this breakdown. Hmmmm, we're pretty chilled about these sorts of things and hate saying people ‘should’ do something. We think it is important as outlined above, however, if you don’t eat these foods on a regular basis, and don’t have any nutritional deficiencies or problems digesting these foods, then you probably don’t need to worry so much about it. And remember that cooking also helps to breakdown phytates and polyphenols so you don’t always have to go that extra step. But if you’re dismissing it because you think it’s a bit hip, or you don’t have time, or don’t think it will make a difference, perhaps have a crack at it and see what you think. Don’t knock it till you try it! IS IT OK TO CONSUME POLYPHENOLS AND PHYTATES? Activating your grains, legumes, nuts and seeds will breakdown some phytates and polyphenols but not all of them, and that is ok. Although they act as anti-nutrients, they also play a beneficial role in the body. Their role as antioxidants helps to fight free radical damage, and consumption of phytates has shown benefits for diabetic patients by regulating insulin secretion and slowing gastric emptying, as well as reducing blood clots, triglycerides and cholesterol thereby playing a potential role in preventing cardiovascular disease. Therefore, activating isn't about completely eradicating phyates and polyphenols, only reducing them to improve nutrient intake and digestion and balancing out the advantages and disadvantages of them. Meal plan and soak overnight according to what we have planned for the next day, or sometimes we'll soak a few things for a couple of days worth of food. For example, on a Sunday night on the kitchen bench we'll have almonds soaking for milk, quinoa soaking for lunches for the week and chickpeas soaking to go in the slow cooker for dinner the next night. If we're trying to get really organised, we'll activate a bunch of things at the same time so they can be either cooked, dehydrated or chucked in the freezer. For example, have sunflower seeds and buckwheat soaking to be dehydrated, quinoa and brown rice soaking for cooking in bulk and almonds soaking to be roasted and made into nut butter. Legumes & grains: cover with water, adding 1 tablespoon of apple cider vinegar per cup of dried legumes/grains. Soak overnight, or around 12 hours. Drain and rinse well and cook or dehydrate as desired, or chuck them straight in the freezer. You’ll need to dehydrate* legumes on low for around 12-15 hours. Grains take around 8-12 hours depending on the grain. Nuts & seeds**: cover with water, adding 1 teaspoon of good quality, mineral rich salt per cup of nuts/seeds. Soak for 8-12 hours, with the exception of cashews, which should only be soaked for a maximum of 6 hours. Drain and rinse well. Dehydrate or use immediately; they can be keep in the fridge for a few days, or chucked straight into the freezer for use later on. * When dehydrating, you really want to make sure these bad boys are thoroughly dried out, as they will go mouldy soon enough. So plan ahead, and don’t skimp on the drying. ** We pretty much only activate sunflower and pumpkin seeds, seeds like sesame are just way too tiny and fiddly. Seeds like chia and flaxseed will not be able to be soaked and rehydrated as they absorb water and expand, however the act of soaking them alone to make things like pudding or chia/flax eggs will help to break down some phytates. 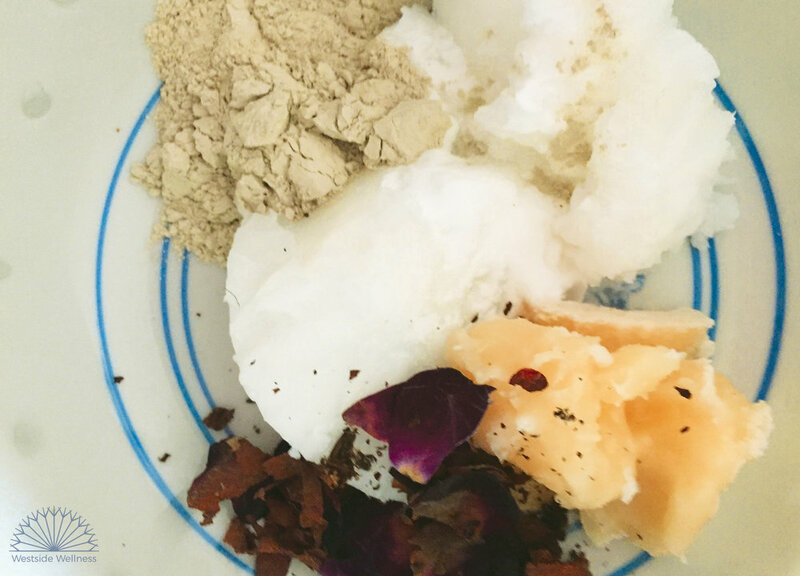 Here at Westside Wellness, we love making our own skin, body and household products, mainly because we know EXACTLY what is going into those products AND because they work so well and are so cheap to make! If you haven't used homemade toothpaste before, it is a *bit* of an adjustment, they are no where near as sweet and minty as the kind of toothpaste you can get at the supermarket, but once you've used it you'll never go back as homemade toothpaste leaves your teeth feeling so clean and helps to remove staining too. One small jar lasts approx 2 months, for extra teeth whitening we add a sprinkling of activated charcoal to our toothbrush a couple of times per week. Place all of the ingredients in a bowl and using a wooden or plastic spoon, mix until well combined. Scoop/pour into a small airtight jar. To use, dip your toothbrush in and cover with the toothpaste. If you use solid coconut oil you may need to use a small spoon to scoop it out. Due to the oil content, we recommend avoiding spitting down the drain, instead you can spit into your compost bin, garden or have a spit jar on hand (a bit gross, but practical). Homemade deodorant is actually simple to make. It takes less than 3 minutes to whip up a batch....but best of all it actually works!! I had tried crystals, natural roll on, alcohol based and all sorts but this has been the only product that keeps both the sweat and the stink away. All you need to do is source a few ingredients and store them in the cupboard ready to bring out when you need to make some more up. Stir well, about 3 minutes for the mixture to become well-combined, depending on the temperature. Place in a glass jar, label and keep in a cool, dark area (especially during the warmer months). Makes about 1 cup which will last last for at least 3 months. We make a lot of coconut milk at Westside Wellness! ....And that means lots of leftover coconut pulp. You can blitz the leftover pulp in a food processor or thermomix and then dehydrate it to make coconut flour, but because baking requires so little of it we often have more than we can handle. I like to use the leftover pulp to make body scrub - it really helps exfoliate dead skin from your pores but at the same time adds a fine coating of moisture to the skin to keep it nice a smooth. The orange rind adds a nice scent and provides a natural anti-microbial element to to the scrub to prevent unwanted skin infections. Simply grab a handful and scrub onto to the skin (pay special attention to the knees, ankles, feet and elbows) while your in the shower. Wait a minute or two and then rinse off - enjoy! Store in 3 x 200mL jars. Keep 2 of the jars in the freezer for up to 2 months. The other jar can be kept in you shower to be used daily until finished, about 2 weeks. Spring is upon us and this means that hay fever season is around the corner. If you, like lots of other Melbournians, are dreading the warmer weather and the pollen it brings then it's time to take action and address the underlying cause of the condition - not just the symptoms it brings. Hay fever is a condition that affects almost 1 in 5 Australians. Victoria is the 3rd highest affected state or territory in the country. Seasonal hay fever is usually triggered by an allergic response to an inhaled allergen - in Melbourne it's usually pollen from plane trees and rye grasses. When inhaled these particles cause inflammation in the nose, mouth, sinuses and throat which can lead to a scratchy throat, itchy nose, watering eyes, constant sneezing and other unpleasant symptoms. Other goodies: ginger, turmeric, horseradish and nettle - make a cup of tea from slices of ginger, turmeric and nettle, served with a slice of lemon. Know what your triggers are! If you think dust is the main culprit then make sure you have a regular cleaning plan in place to minimise the amount of dust in your home (especially your bedroom). If you suspect that pollen is causing the problem then you can apply an ointment to your nostrils to reduce the amount of pollen you are inhaling. We recommend using paw-paw ointment or sesame or coconut oil for this. If you're unsure what your triggers are, get in touch with our team to find out how we can help with testing or identifying potential triggers in your diet and environment that may be contributing your hay fever. What's my digestive system got to do with it? There are lots of approaches you can make to maange your hay fever. As naturopaths we commonly address what is referred to as "leaky gut" or "intestinal permeability". This is the theory that a damaged digestive system allows partially-digested food partials to enter through the walls of the intestines and triggers an immune response. You can use probiotics and herbs such as Golden Seal, Echinacea, Baical Skullcap, Nettle and Fenugreek to manage the "leaky gut" and reduce the over-reactive immune response. At Westside Wellness always recommend that you seek the care and advice of registered naturopath before using any of these therapies. These are powerful medicines and can have interactions with other supplements, herbs and medications, not to mention negative consequences for your health if used improperly. Want to find out how Westside Wellness can help overcome your hay fever? Book a free 10 minute phone assessment to find out more. Medscape 2017, "Allergic rhinitis", updated 10th April 2017, viewed 1st September 2017, <http://emedicine.medscape.com/article/134825-overview>. The Conversation 2014, "Hay fever survival guide: why you have it and how to treat it", updated 17th November 2014, viewed 1st September 2017, <https://theconversation.com/hay-fever-survival-guide-why-you-have-it-and-how-to-treat-it-34000>. Australian Institute of Health and Welfare 2011. Have you ever checked the ingredients of you favourite skin cleanser? Most of us would struggle to pronounce some of the ingredients, let alone know what they are or where they come from. Many substances used in skincare manufacturing (such as EDTA, sodium lauryl sulfate and formaldehyde) are harmful to our bodies. In many instances they are known carcinogens (substances known to cause cancer). You can avoid these harmful substances simply by making your own skincare products at home. It’s fast, cheap and so simple to do. I whip some a batch of this skin cleanser every month or so. It's gentle and effective, you can apply the product to the skin every day - it's both nourishing and deep cleansing to clear out clogged up pores. If you find the skin is too oily, simply cleanse you skin at night and by morning the oil will have absorbed into your skin, leaving it soft a smooth. Bentonite clay is formed by volcanic ash and contains many minerals including silica and magnesium. It acts to detoxify the pores of the skin due to it's difference in electrical charge. This assists it's drawing action to pull excessive oil and gunk from the pores to give you softer, smoother and clearer skin. To learn more about Calcium Bentonite (green clay) - we recommend reading more here. Bentonite clay strips heavy metals from the body and from any minerals it comes into contact with….including your aluminium or stainless steel cookware. Mix all ingredients in a non-metallic bowl and store in a glass jar. Leave ample room in the jar as the mixture will swell as the clay expands. To use simply wash your face with warm water. Apply a small amount to the skin (about the size of a 20 cent coin). Massage into the skin and wash off with a warm wet face cloth. Keeps for up to 3 months in a sealed container. I prefer to use a glass jar for a container but you could also use a food grade plastic one. In the warmer months the oils will separate, simply stir to recombine. We see a lot of patients who find themselves endlessly sick over the winter months, and often this constant stream of illness spills out over into spring and the rest of the year. There are many factors that can impact on immune system function and if it is a problem for you it is best to see a naturopath, and chat with your doctor, about investigating why you're getting sick so often, however there are some simple things you can do to beat those niggling winter colds and flu. Changing your toothbrush! Think about it, you've been sick with a sore throat, runny nose and all that business and every day you've been brushing your teeth with the same infected toothbrush, pushing those germy germs back into your mouth and throat! Our tip is to change your tooth-brush at the first sign of sickness, change it again as your symptoms disappear and then change once more a week later just in case. Wash/change anything that your mouth comes in contact with. Similar to the toothbrush tip, washing things that your mouth comes in contact with, like your drink bottle with hot soapy water can help to prevent reinfection. Consider changing lip glosses and lipsticks too. Wash your hands! You don't need any fancy antibacterial soaps, just regular soap and warm water will do the trick. Washing your hands should take about as long as singing 'happy birthday' twice, try singing along next time you wash and see how long you are actually taking. Clean taps and surfaces that you come in contact with during and after being sick. Again, you don't need to use harsh chemical or fancy cleaners. Hot, soapy water and antibacterial agents like white vinegar and essential oils such as tea tree, eucalyptus and peppermint will totally do the trick without subjecting yourself and your family to any nasties. turmeric: another incredibly potent anti-inflammatory and antioxidant rich herb. Like ginger, the fresh stuff can be finely chopped and added to cooking, or chucked into juices and smoothies. Turmeric paste or powder is also very handy to have on handy to add to cooking or make into 'golden milk' latte. Onion: a potent anti-inflammatory, antibacterial/microbial and antioxidant (super high in the potent antioxidant rutin) that you can incorporate into your diet, the easiest way being to add onion to main meals. Another simple way to get onion-y goodness into your when your feeling sick is to slice an onion, place in a bowl and cover with honey. Leave to soak overnight, the next day straining the juices into a jar (discarding the flesh). Add the onion/honey juice to teas or hot water, or eat off a spoon regularly throughout the day. The antibacterial/microbial combination of the onion juice and honey will help to fight off whatever nasty you're battling. If you're seeing a bit of a theme with these nutrients, then you are right! The key to getting all those immune boosting nutrients is a bright, colourful and varied diet. When we're sick, our gut bacteria can become disrupted and the balance between beneficial and not so beneficial bacteria can get out of whack. This can have an impact on our immune system function and make us more susceptible to illness. Regularly eating pre and probiotic rich foods can help keep this balance in check. Prebiotic foods feed the beneficial bacteria in our gut and probiotic foods actually contain the beneficial bacteria that reside in our gut. This is a pretty tricky one! We need sleep to help our bodies rest and regenerate overnight, and broken or reduced sleep can massively impact the way our immune system functions. Some of us can get the quality and quantity of sleep that we need, however others aren't so lucky. If you're a parent, like us, with children who don't sleep, like us, then you're going to find this next to impossible. Having said that, if you are struggling with how your kids sleep and are open to it, ask for help! You never know what advice you may get, it could be something simple that you overlooked, a routine that needed tweaking etc, and before you know it you could be getting the sleep you so desperately need. If you aren't getting enough sleep and its something you can change yourself, then please do. Go to bed early a few nights a week, limit screen time before bed and keep your phone out of your room (or at least away from you bed). If getting enough shut eye if a problem that you can't fix yourself, consider seeing a naturopath to help get you on the right track. This can be a tough one when sick, I personally hate drinking water when I've got a cold. What I do like when I'm sick though, are hot teas and broths, and this is the easiest way to get more fluid into you. Think homemade chicken broth or miso soup, herbal teas (things like peppermint, chamomile, ginger, turmeric, rosehip are great for colds/flu), warm lemon, honey and ginger. Sip on these regularly throughout the day and you're well on your way to flushing out toxins and upping your hydration. If you're struggling with constant bouts of sickness during winter and beyond, its time to make your health a priority. Give these tips a go, and if they don't set you on a path of less sickness, perhaps its time to book a consult with us.